The world has changed dramatically over the last decade, and measuring the factors that determine competitiveness continues to be a highly complex process. 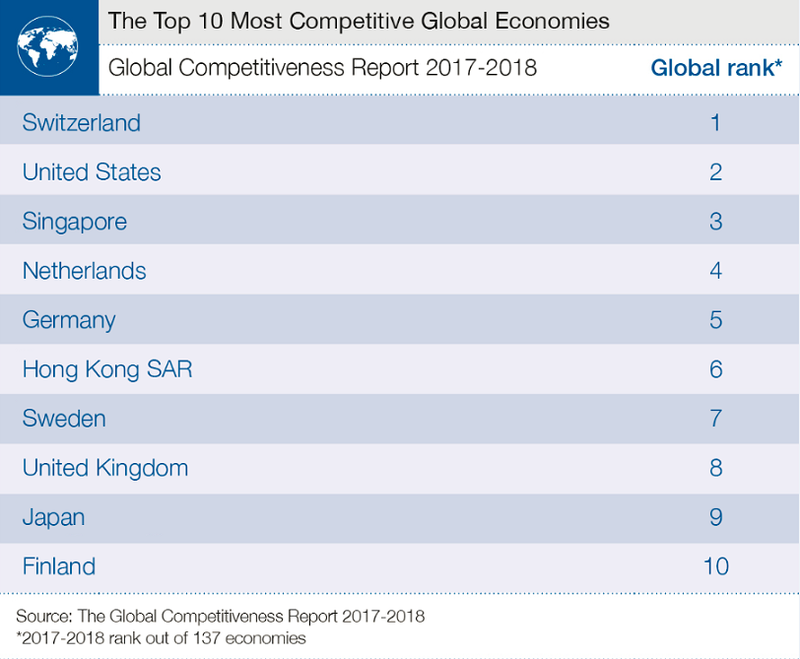 That’s why in order to calculate the World Economic Forum’s Global Competitiveness Index we use hundreds of different measures and consider many factors. It’s certainly true that the Fourth Industrial Revolution – new, rapidly changing technologies in many different fields – has changed the way we need to measure some aspects of competitiveness, particularly in relation to innovation and ideas. We need to stress, for example, the value of ideas and collaboration within companies; the values of open-mindedness, of connectivity, and the value of an entrepreneurial spirit. Once we have an idea, is it easier to implement in country A or country B? And we have had to emphasize a new kind of education, one that is more conducive to students' creativity, their ability to observe and generate ideas. The new industrial revolution, also known as the 4IR, has forced us to put more emphasis on all these aspects of a nation’s innovation ecosystem. Even so, the concept of competitiveness remains unaltered: it is a combination of the factors that determine the productivity of a nation, which is both the foundation of a nation's standard of living and its engine of economic growth. Most importantly, the result is that the most productive countries are able to afford all the factors that are not directly connected with competitiveness, but are crucial to the well-being of a population. Equitable income distribution is one important example. There is no example of any country in the history of the world that has achieved these vital social goals without economic growth. So while growth, per se, is not the objective - and is not, in itself, enough - it is a necessary condition if countries are to achieve these other social aspirations that are so desirable. The World Economic Forum also publishes an index called the Inclusive Development Index. Its measurements include growth, social inclusion, and national equitable income distribution. There is a very clear correlation between the Inclusive Development Index and the Global Competitiveness Index, meaning that it's only if you are productive, only if your economy is competitive, that you are also able to develop socially desirable features, such as inclusiveness. Over the past 10 years we have seen four major trends in the world that all need to be considered, discussed and dealt with. 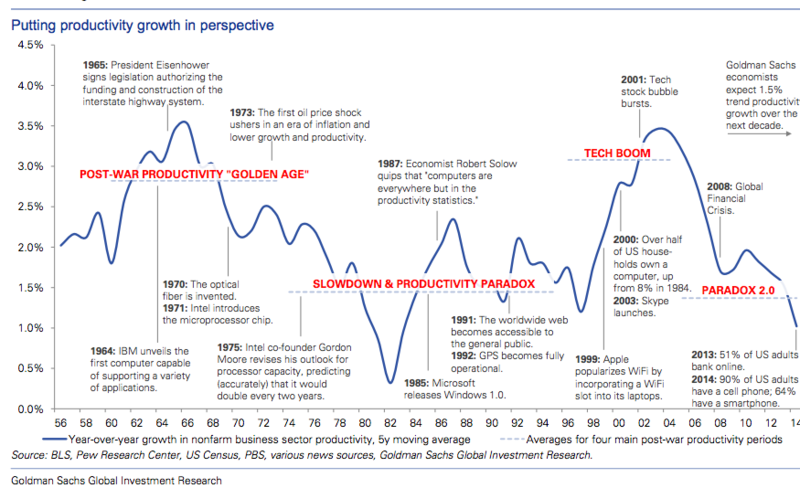 Global productivity is not growing as fast as it used to be; it has slowed down. This is a paradox because the world has seen extremely rapid technological innovation. How is it that all these new technologies are not resulting in higher productivity? This is a question many economists have pondered over the last decade. There are several possible explanations. One is that the innovations are simply not making us more productive. The major innovations associated with the first and second Industrial revolutions, such as the steam engine, the internal combustion engine and domestic machines (like the washing machine), dramatically changed the way we produced goods. We became far more productive. It has been argued that today’s innovations may be cool and nice to have – we may have better-looking smartphones that allow us to play Pokémon GO, for example – but that’s not particularly productive. That’s one explanation for this productivity paradox. A second explanation is that today’s innovations are making people’s jobs obsolete. Imagine you have spent five years studying how to process airplane tickets by hand, understanding the airline codes and so on. Then, almost overnight, this process is automated and your skills become worthless. This is happening over and over in different professions: machines can calculate accounts, for example, or tax returns, and accountants are no longer needed for these tasks. A further explanation for the lack of productivity is that we have made mistakes over the kind of investments we have made. The fact that interest rates have been extremely low has meant that we have been able to invest vast amounts of money, but perhaps these investments have not been especially productive, or useful. Another possible cause is that the population is ageing in Asia, Europe and the United States. And as the population ages, obviously it becomes less productive, and we have a higher proportion of people who aren't productive at all. The final explanation – and the one I favour – is that we don’t measure GDP correctly, and in order to measure productivity levels accurately you certainly have to measure GDP in the right way. GDP measures the value of goods and services produced in a country over a year. This worked fairly work well when our economies produced goods (like potatoes or cars) where we can multiply the price of potatoes by the amount of potatoes produced and add the amount of cars, multiplied by their price, to arrive at the total value of what is produced in a country. But in today’s world we have so many innovations that produce things that are free. To the national accounts, the value of the services Google provides to its users – its contribution to GDP – is zero, because those services are free. The contribution of Facebook and Twitter’s services are also zero. But Google makes my life easier in significant ways. We no longer have to go to the library to search for hours for the documents we need, for example; but the productivity we have gained by using Google’s search engine is not counted at all. This is the case with many innovations - and so it could be that a large element of GDP is going undetected, and that economies are actually growing a lot faster than we think. In fact, evidence suggests that globally we are missing as much as a full percentage point a year: instead of growing at 2%, we are growing at 3%. Compounded over years, this is a huge difference. The appearance of very disruptive technologies has been incredibly rapid. If we go back 10 years, the iPhone didn’t even exist. We have seen huge developments in artificial intelligence, new materials, synthetic biology, big data and on-demand technologies, and all these are changing the business landscape at a planetary level. Significantly, many of these innovations did not occur in those countries where technology used to be produced almost monopolistically. It is no longer the case that only the US and Europe innovate; the new industrial revolution has created opportunities for nations across the globe. This is a hugely important trend. There has been great convergence over the last 40 years between economies, and the incomes of the citizens who live in emerging markets have continued to grow faster than those who live in advanced economies. 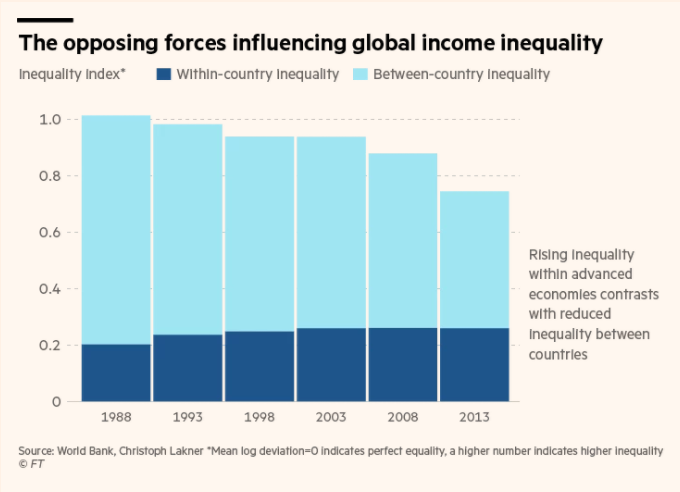 Income inequality at the global level has therefore been decreasing. However, despite this, we have seen rising income inequality within countries. So while incomes in China are getting ever closer to those in the US, Americans relative to each other are moving further apart. This is partly a consequence of the Fourth Industrial Revolution, which is taking away middle-class jobs. This is different from previous industrial revolutions, which essentially benefited the poor. People moved from low-paid agricultural jobs to better-paid ones in the city. And in previous industrial revolutions the far slower pace of change meant that, although people did lose jobs, they gained them somewhere else. They had time to adapt. That is not the case any more. And because technological changes are now so rapid and the middle classes suffer as a result, there are political consequences, notably the current waves of populism: Trump, Brexit, Le Pen, the rise of neo-Fascism and leftist movements in Europe are examples. The fourth trend, which we discuss in the Competitiveness Report, is that over the last few decades 4 billion people, especially people in Asia, have entered the world’s labour market. These people are highly skilled, well trained and educated, and they have taken jobs from developed countries. This has also contributed to populism, and was one of the main complaints of those who supported Donald Trump or Brexit – "We are losing jobs to foreigners." The consequence has been a backlash all over the world against trade, against globalization; and a dangerous strand of neo-nationalism has emerged. It is vital, then, that we change labour policies in the West. It is increasingly clear that we need to combine flexibility with job security, because it is also increasingly clear that these two are not incompatible. The strategy in many countries has been to have less job security in order to compete. Policies have stripped workers’ rights in order to have more flexibility in the workforce. And this has been a mistake. What does the Fourth Industrial Revolution mean for migration? You can have more flexibility AND security. This is the way some Nordic countries have been heading, and their unemployment rates are almost zero. The idea is that we need to protect workers, and this does not necessarily mean protecting their jobs. To do so, we need to find ways to help those workers who lose their jobs to find alternatives. This may mean more active retraining policies rather than policies that protect the old jobs. We need to rethink this combination of flexibility and security, so that we can create jobs in the West while enshrining rights that protect workers. If we don’t, we are going to see a further rise in nationalism, fascism and populism. All this is why competitiveness, and the idea that countries should develop competitiveness, is more vital than ever. It is only through being competitive that we will have the means to address these four big trends. If we do not address them correctly, with a lack of resources, we will have more of the unfortunate consequences that we have already seen emerge.